In 10-inch skillet, cook bacon over medium heat, stirring occasionally, until crisp. Remove bacon with slotted spoon; drain on paper towels. Drain all but 3 tablespoons bacon drippings from skillet (if fewer than 3 tablespoons remain, add enough vegetable oil to drippings to equal 3 tablespoons). Add oil, onions, sugar, salt and pepper to drippings in skillet. Cook over medium heat 2 to 3 minutes, stirring occasionally, until onions are slightly softened. Stir in vinegar. Place spinach in very large bowl. 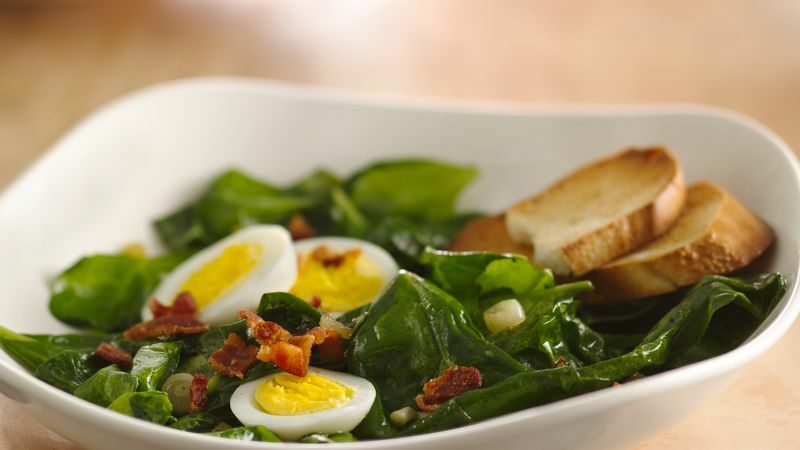 Pour warm dressing over spinach; toss to coat. Arrange egg slices on top. Crumble bacon and sprinkle on top. Serve immediately. To wash fresh spinach, remove and discard spinach stems. Place leaves in a sink or bowl filled with cool water. Swish with your hands in the water to rinse the dirt off the spinach. Lift the leaves up to drain off excess water. Repeat until no dirt remains, changing water if necessary.